We Be Reading: "There were five of us--Carruthers and the new recruit and myself, and Mr. Spivens and the verger." "There were five of us--Carruthers and the new recruit and myself, and Mr. Spivens and the verger." Again, I have to thank Teresa for suggesting that I pick this book up sooner than later. She guess correctly that this was a book that I would enjoy. 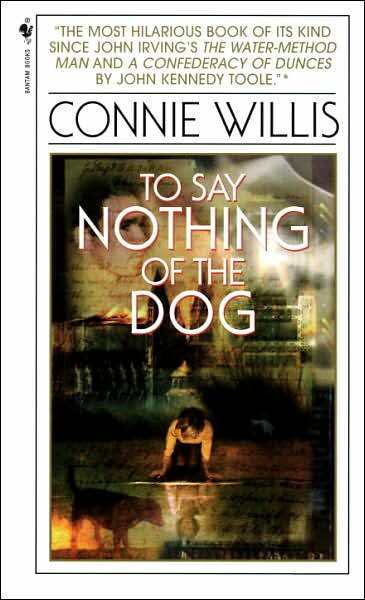 Based on Jerome K. Jerome's Three Men in a Boat, Connie Willis' To Say Nothing of the Dog is a time-travel comedy of errors with a touch of romance and a whole lot of Victorian manners and I loved it! Ned Henry is a time-traveling historian who is on a tedious and seemingly impossible quest to find the location (in time and space) of something called a "bishop's bird stump" for the detailed rebuilding of the Coventry Cathedral in 2057. His quest is interrupted by the arrival of fellow historian Verity Kindle and the item she's brought forward from the past. Since it's not supposed to be possible to move anything through time, Ned is quickly dispatched to return the item to its place in Victorian times. Unfortunately, he's suffering from something called time-lag -- a condition related to excessive time travel that has such symptoms as Difficulty in Distinguishing Sounds, Tendency to Sentimentality and Drowsiness. So when he heads to the past, he is a bit confused as to what he is supposed to do, where he is supposed to go and, really, what one is supposed to act like in Victorian England. Some of the little information he has is what he knows from having read Three Men in a Boat -- a book that is about to be written. What follows is a complex and funny set of events that spans decades and may or may not cause Hitler to win the war. Support our site and buy To Say Nothing of the Dog on Amazon or find it at your local library. We borrowed a copy from the library, read it and then promptly went out and bought a copy for our home collection. Huzzah! I *knew* you'd love this. She juggles all the genres perfectly and seems to have such fun doing so. I really want to read more of her books now. I love books that mix genres, as long as it's well done, and this one sounds fun! I'll definitely try it at some stage - thanks! I'm so glad you found a book that fits your sensibilities so well. It does sound like a lot of fun. I have it waiting in audiobook, but somehow I keep putting it off. Probably because I know I'll enjoy it more if I actually read it in paper format. Teresa - I will definitely read more by Willis -- probably Blackout and All Clear next. Tracy - I hope you enjoy it! It's quite smart so I think you will. Jenny - Since we are twin time-travel fans, I'm pretty sure that you will like it! 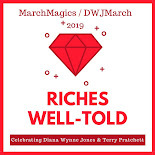 Jenners - Who knew that there was a book out there that mixed my favorite genres! Crazy! Alexandra - I think this one would work better as a first read on paper because it's quite complex and you may have to read sections over and over. At least I did.